Designed for beginner to intermediate surfers, our quality surfing lessons take place at Ukumehame Beach Park (weather dependent), conveniently located between Kihei and Lahaina, and away from the crowds. Our 4:1 student to instructor ratio (for group lessons) allows for very personalized attention. Looking for a private intermediate or advanced surf guide experience? Click Here! We are Maui’s only female-owned surf school, and the majority of our instructors are female, but we’ll teach anyone! 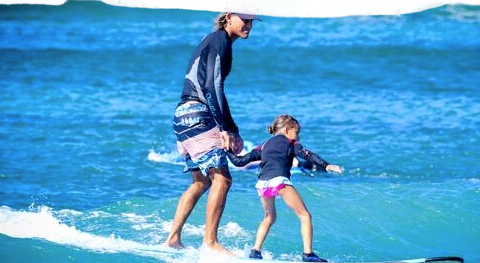 Our surfing lessons are open to men and women, and children ages 5 and up! Each surf lesson is two hours, and includes a surfboard, rash guard and booties! Offering surf lessons Monday – Saturday, next day bookings close at 5pm Hawaiian Standard Time! Our website features LIVE availability, click on your desired lesson below and see all the upcoming openings! Book early for peak family travel seasons – Spring Break, Summer and Winter Breaks! Our small class sizes mean lessons can book up weeks in advance! Starting 8:00am, 10:30am and 1:00pm. 2-6 students – limited to your own party. *For Groups over 9, please email surfschool@mauisurfergirls.com for more information! Perfect for any couple celebrating a special occasion – honeymoon, anniversary or a kid-free vacation! Package includes a photographer to capture the whole experience and a bottle of champagne or sparkling cider to take back to your hotel or condo! Why Book With Maui Surfer Girls? There are over 20 surf schools on Maui, but the complete experience that we offer sets us apart from our competition. Book our surf photographer to capture all the fun at your surfing lesson. Action photos and family/couple beach portraits included. Receive a link to download up to 40 high-resolution photos/pp or more depending on group size. $25 for each additional person in your party. Upgrade to the photography package when booking online or over the phone, but please pay the photographer at the beach (cash or cards accepted). 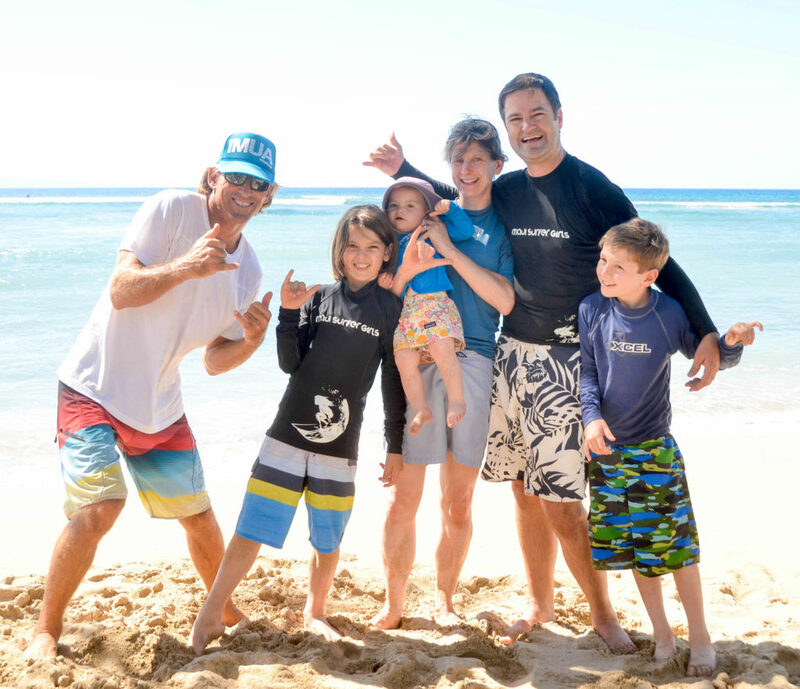 Our Photographers will capture a family photo (with and without your surf instructor!) and as many action shots on the water as they can get! 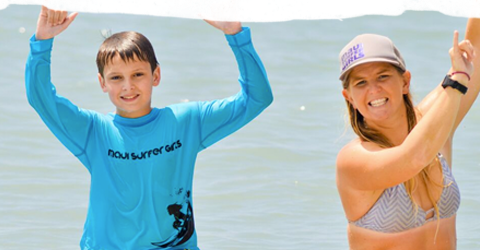 We at Maui Surfer Girls want to ensure the full safety of our students. Due to the dynamic conditions that may occur when learning to surf we have important safety policies. Being a strong swimmer is not a must but being able to tread water and feel confident in the ocean is important. Our policies state that any student AGES 11 AND UNDER or one that is not a confident swimmer must book a private lesson. A private lesson does not ‘separate’ your child from the rest of the family, but their own instructor will stay with them on the water the entire time. By booking a private lesson, our MSG staff can ensure the safety of our students and therefore students are able to get the most out of their surf lesson. Please be prepared before your class with a non-drowsy seasickness medicine.